All materials stored on site for productive use. Trees cut to length for milling with lumber available for project use. Mulch for landscaping. Firewood for wood heat. Below are a few photographs of our crew, having cribbed up beneath the old wooden girder featured in our prior articles Center Beam Replacement 19th Century Post and Beam House Harrison NY, and Structural Preparations Harrison NY We are ready here to cut and remove the failed girder. Ben is featured cutting out the beam with a chain saw. Israel and Gerald are featured prepping the cribbing before the cut. Below Shows the girder removed with the old joists notched. Initial preparations in Harrison NY. Scope: Shore floor framing in new solid footings. Reinforce original wooden girders at basement and 1st level floor then shore second level. Remove cracked beam and replace with new locally sourced white oak timber with inserted steel reinforcement. Lest there be any confusion, Doctor Structure does make house calls. 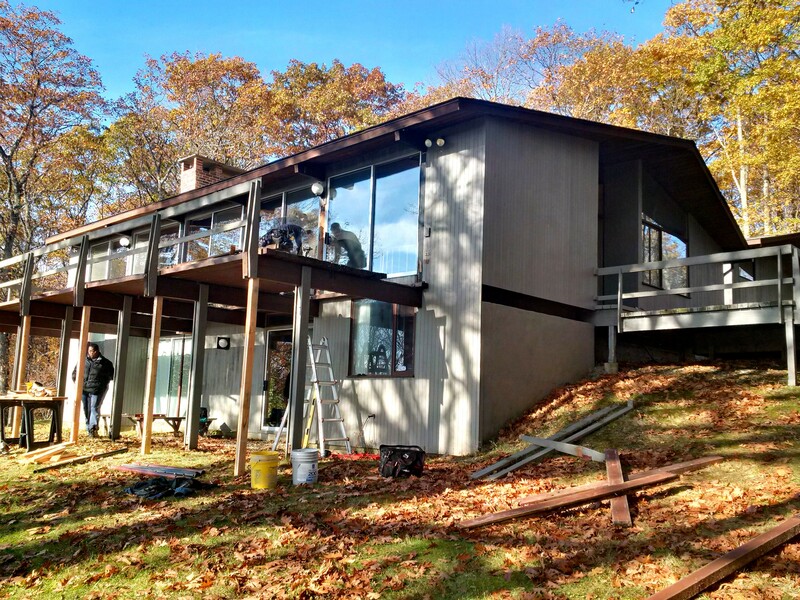 Pepper Pond Deck House restoration Sherman CT. Credits as above. Eli installs new custom white oak hand-rail stanchions on restored Deck House in Sherman CT. This article was published this week it is copied in full to our blog. Ben “Doctor Structure” Fiering, the master builder at Third Floor Corporation, knows better than most that good things take time.“We try to be mindful of the time, but…” says Ben, before trailing off. He chooses his next words carefully. After five minutes of speaking with Ben, it’s clear that he’s passionate about the construction and restoration work his company does every day. He’s not shy about admitting that high quality work is their number one priority. Ben started Third Floor Corporation in 1993, but he’s been in the industry since the early eighties, when he started working construction while studying social history at college. His passion for building things had been kindled even earlier than that by his father, Norman Fiering, a skilled carpentry hobbyist. A recent project completed by Third Floor Corporation. Architecture by David Wallance. Third Floor Corporation was started in Manhattan, and their first project was converting old warehouse space in to a three-unit live/work space for artists. Today, they are a full-service construction and general contracting company serving private residential clients in New York’s Hudson Valley. “I live in one of the most beautiful places in the world,” Ben says of the Valley. In his spare time, Ben enjoys exploring the area’s abundance of nature, photography, playing guitar, and studying the history of art, craft, and architecture. Ben “Doctor Structure” Fiering at work. From the way Ben talks about his line of work, it’s clear that Third Floor Corporation are not your average construction company. They specialize in structural repair, and the restoration of both classic and modern architecture. “[We have] an intimate understanding of the challenges involved in the restoration of antique buildings,” Ben says, when describing what separates his company from others. He speaks with pride and admiration when talking about his staff, the trademark of a business owner that treats his employees with respect. With over thirty years in the workforce, though, Ben is the first to admit he’s faced some challenges. While 2017 is sure to hold some challenges of its own, Ben does not seem fazed. Perhaps it’s because building things is more than a job, for Ben; it’s a passion he inherited from his father. If you’re interested in discussing a project with Ben from Third Floor Corporation you can reach him on (914) 263 6148 or at ben@thirdfloorllc.com. You can also follow Ben on Twitter as @Dr_Structure. Looking for something else? Submit a free request on EZBZ for what you need and where you need it, and we’ll get you quotes from providers in your area. Try it out today at myezbz.com. The following list is the required list of tools to be in the possession of a carpenter’s apprentice on her or his first day of work for Third Floor Corporation. Apprentices helpers and contractors who desire to advance to the standing of carpenters on Third Floor Corporation projects, should come to work every day equipped with at least the following tools and a tool bag or box in which to keep them organized. –A note pad on which notes can be taken and drawings and calculations made. –A tool belt or a combination, hammer holster and nail apron, or one of each which will accommodate a hammer, fasteners and some or other simple tools to be worn when working in appropriate conditions. This Carhart set shown below is light and easy to take on and off for those of us who prefer not to work wearing a heavy belt. This cotton nail apron for less than 3 dollars is acceptable if worn with a hammer holster and a basic belt that will hold a tape measure. The master carpenter who first trained me worked this way, with a simple cotton nail apron and a hammer holster. –A tape Measure.. and one of good quality, Stanley, Dewalt, Milwaukee, etc with a wide rigid blade of at least 16′. –A carpenter’s pencil and a standard pencil and means of keeping these sharpened. –A Framing Hammer of some sort with a waffle head. I recommend a wooden handled Framing hammer but this is not required. –A finish hammer preferably 16 oz and must be smooth faced so as no to mar finish woodwork. I recommend the hammer below. It is a lifetime tool and can be used to pry nails and such due to its strength. –A “catspaw” nail puller. such as this one shown below. There are many variations on this tool from Stanley, Vaughn, Bostitch and Estwing and Dewalt. personal preference should prevail but you should have a durable double ended tool of this type. –A combination square, I recommend the classic Stanley tool below. It is durable, inexpensive and the markings are etched so they will stay readable as the tools ages and wears. –A set of good long body wood chisels and a stone to keep these sharp. This set below is available at the home depot. –A set of simple screwdrivers or a combination screwdriver with a #1, #2 both Phillips and flat. –A Lineman’s Pliers. These Channel Lock pliers will last a lifetime if kept oiled and dry. In a pinch you can cut through a deck screw with these to shorten it. Klein also makes a pair of these as do many others. –A chalk line.”Chalk Box” .. and some chalk to put in it’ This Irwin “Straight Line” solid aluminum chalk box doubles as a Plumb Bob and has yet to be improved on by more expensive plastic bodied models. –A two foot Level. and over time a plumber’s level and a 4′ level. In addition to these it is useful for people to have in their cars some basic painting supplies, a caulking gun putty knife etc. 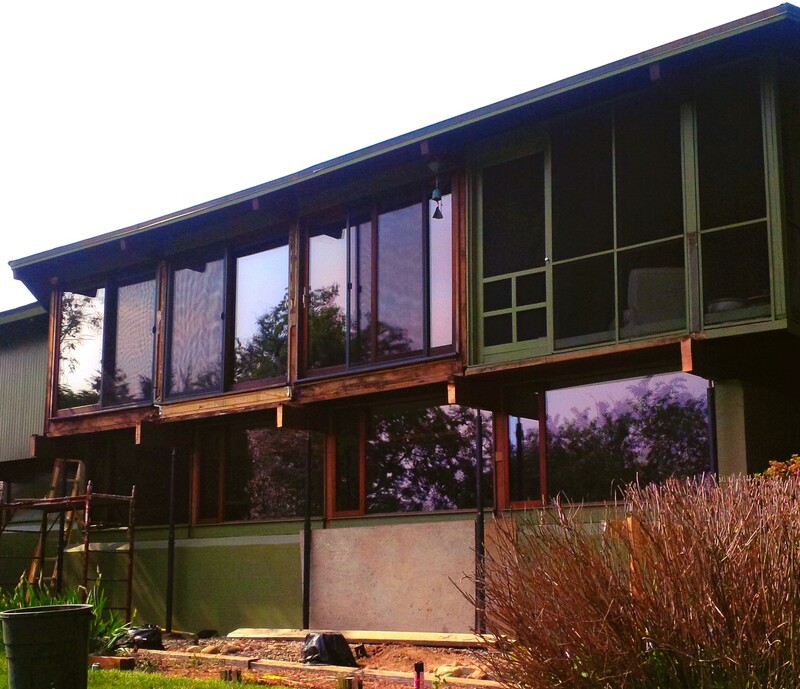 Structural Rehabilitation of a ‘balcony deck’ on a classic (1960’s or 1970’s) Deck House. This article describes the process adopted by the Third Floor Corporation construction crew in approaching the structural rehabilitation of a common feature of classic period Deck Houses, the balcony deck. The task is relatively complex because the substructure of these also supports cantilevered elements of the upper level floor and in many cases roof loads . So when decay sets in to the decks on these houses the repair often involves providing structural support to the core elements of the house. In the past year alone we have repaired versions of the same condition on 5 houses and viewed symptoms of the similar developments in a few others. to make a repair that is permanent for all practical purposes, one that is structurally and mechanically equal, if not superior, to the original construction. to preserve the architectural, stylistic, aesthetic, and structural integrity of the house without compromise. A project of this type must be approached in a a definite order. The first step must be to set up shoring elements to support the critical house structure during demolition. Additional shoring is placed to ensure that the demolition process is controlled and safe for the crew. As has been described, in a typical Deck House balcony assembly the rafters supporting the roof deck are laid out on the same 8′ on center pattern as the deck balcony girders. 4×4 posts between the sliding doors transfer the roof loads down to the girders. In order to remove and replace the decayed girders and posts the rafters must be supported directly on the interior of the house. In both the Hillsdale and Norwalk jobs we jacked sunken rafters back to their original height slowly during the course of the job. A 2x 8 plate is installed in this photo. This ties the rafters to each other at the bottom to help prevent rollout as the jacks are tightened. This course of jacks is supported from below so that the roof loads are transferred directly to the basement slab. Additional jacks are installed between the girders to support the cantilevered section of the upper floor while the girders are removed. We use heavy duty adjustable steel jacks with a threaded cap. These are very strong and allow for fine and measured adjustment. We also use hydraulic jacks for rapid adjustments or where additional force is needed as well as solid wooden members for static shoring. Once the core structure of the house has been properly supported and we have used the jacks to relieve the loads from those elements that we will remove and replace, then we begin the basic demolition. Because of the unstable nature of the conditions static shoring has been added to the deck girders while the balcony deck boards are removed. Eli Writes “We removed the deck entirely, along with the six girders, all of which showed damage on the top face and, more importantly, at the joints with the structural posts above. The six columns supporting the deck were also in bad shape. The 4×4 columns rested on a 2 ” galvanized pipe mount set in below-grade concrete footings. Many of the pipes were terribly corroded, several being nearly rusted through. Deck used to supply these post mounts as part of their kits. 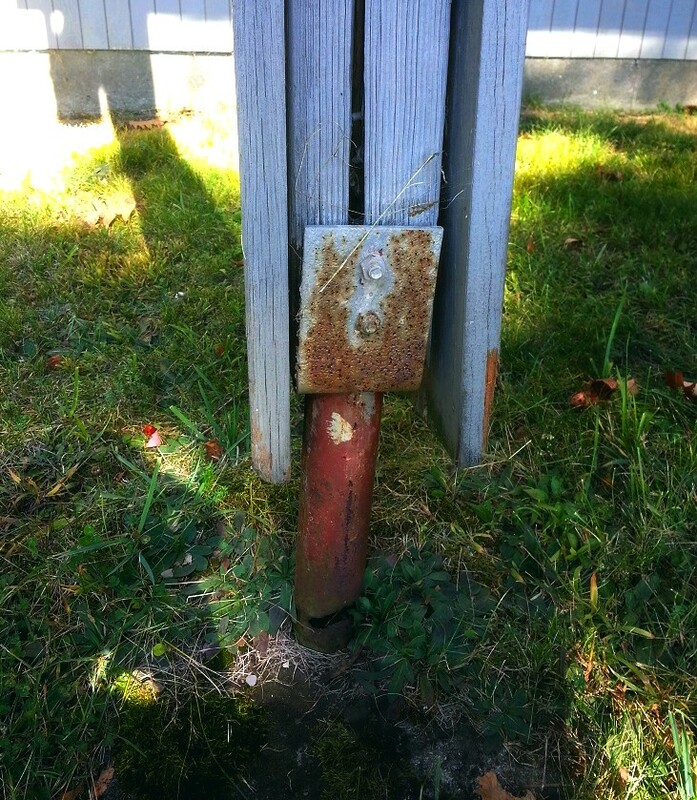 These mounds made of galvanized pipe with a welded stirrup are prone to rust over time and should be replaced where possible on still existing houses. Indeed, once disconnected from the deck above, one column keeled over from its own (inconsiderable) weight. The house structural damage had a few consequences: in the interior, the floor had begun to sink at the point of worst damage, and the floorboards had begun to separate. (The most damaged post had also kicked out from the house several inches over six feet. ); and the existing mahogany sliding door sill (and the radiator beneath it) had sunk where the post damage was worst, buckling the recessed radiator and deforming the sill. Due to the weight of the 4×12 girders and their critical attachments which penetrate the house we approach their removal carefully. If one kicked suddenly loose, aside from potentially injuring a worker or collapsing elements of the shoring, the leverage from a shifting girder still embedded in the house walls or directly supporting a load bearing column could cause significant damage to the house. After shoring the girders we remove the old decking. Carpenter Mike Roldan cuts the through nails on Deck House Balcony here using a sawzall. A grinder with a metal cutting wheel is also convenient for this task. Once the through nails have been cut the boards can be lifted off the girders with a crowbar. The deck surfaces on a Deck House which has been built to specification perform greater structural work than so on a conventional stick framed deck. Their removal should be conducted with care and the sub-structure properly shored against lateral movement to avoid injury or damage. The decks on these houses are constructed of 3×6″ solid cedar timbers. They are fastened to each other with 10″ long nails through the sides of the boards and span eight feet without intermediate support on the finished decks. A hardened rubber spacer is installed with the nails to maintain equal spacing and to provide weather protection for the exposed nail shank. The deck boards are also typically ‘toe-nailed’ (nailed at an angle) from the side faces down to the girders. Note the thickness of the lumber on this Deck House Pleasantville NY. Standard decking on stick built houses is 5/4″ nominal, about 1″ thick actual, whereas the solid cedar decking provided by Deck House is 12/4″ actually about 2 5/8″ thick. Due to the thickness of the material it is possible to reclaim a significant portion of the removed decking for future use. This stair is built entirely of reclaimed cedar decking from the upper level deck which was replaced with new material. Once the decking has been removed then the damaged girders can be cut away. It is best to conduct this task by supporting the girders and through cutting them into smaller pieces. Then the remaining short ends can be removed from their insertion points at the house. At this stage jacks and shoring directly supporting the girders are replaced with jacks supporting the floor loads on either side of the beams. If the rafters have been properly shored and jacked to relieve pressure on the columns which are between the sliding doors then the floor loads on the two foot or so cantilevered section are relatively light. Still they must be supported to avoid shift of interior finish work. In many of the houses, as is the case in both the Hillsdale and Norwalk, houses a heating element runs beneath the sliding doors in a small sill. As is shown and described above often the decay has spread to the whole insertion point of the girders, the post bases and the built up sill under the sliding doors. This shoring which, once the roof is supported, only supports a small area of the floor and the sliding doors themselves may have to be moved and repositioned several times as decayed sections of the sill are replaced. It is advisable to remove the glass panels of the sliding doors in order to relieve weight from these positions as well. The frames may or may not need to be removed and or replaced depending upon their condition. If needed Deck House makes available suitable replacement parts for these elements. It is advisable to remove the glass panels of the sliding doors in order to relieve weight from these positions as well. The frames may or may not need to be removed and or replaced depending upon their condition. If needed Deck House makes available suitable replacement parts for these elements. Now that the shoring critical demolition and as needed repairs to the interior tongue and groove floor decking and sills is complete new structural girders must be installed in the old insertion points. On both of the jobs described the footings supporting the outer deck columns were also replaced or substantially repaired. The builder in this case must keep in mind that these footings support not just the deck but major portions of the house and roof loads, snow in the winter etcetera. Also, due to the nature of the construction rigid post connections at the ground and at the top of the columns where they meet the girders is desirable. In Norwalk we used 12″ diameter Sonotube with a 28″ diameter Bigfoot footing base, the concrete was steel reinforced. Our process was to complete any concrete work prior to installing the new girders but to leave the finish posts off at the first stage of assembly and to support the new beams on rigging and scaffholding until proper levels were established and the new frame was relatively rigid. 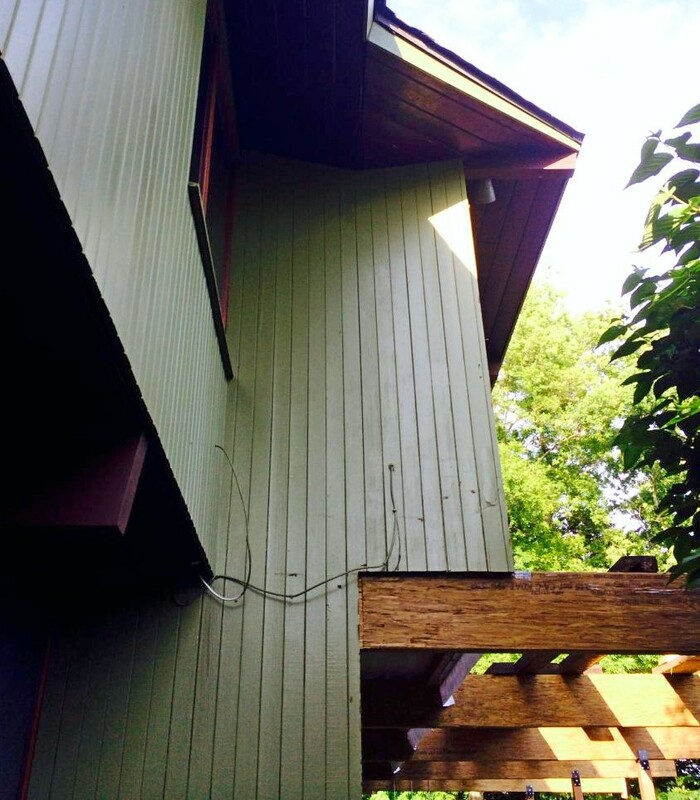 On both jobs we added an element not typically found in Deck House construction of the classic period. 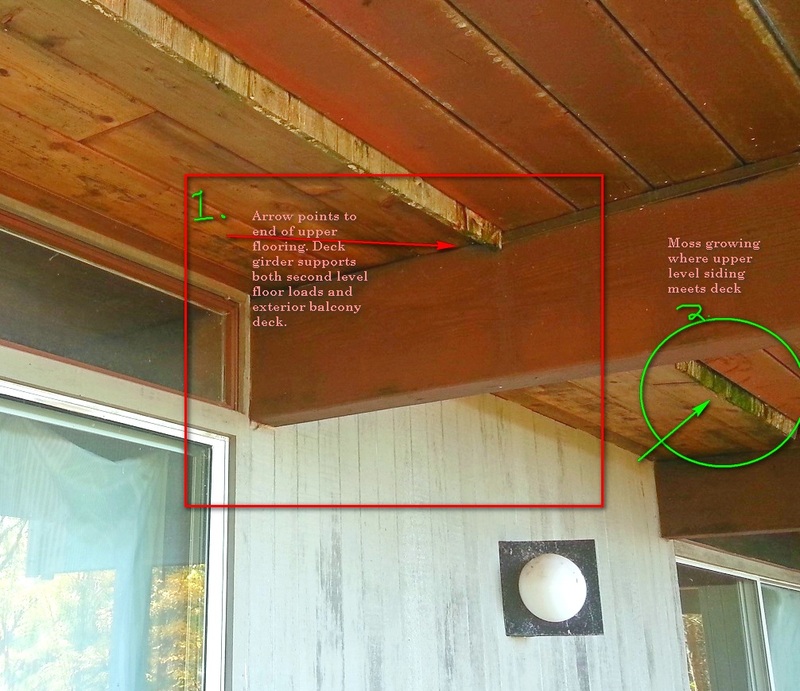 this is an horizontal “cross beam” or bridging of pressure treated 4×6, directly below the sliding doors at the face of the house below the tongue and groove floor decking and half notched over the girders. This element is added to improve rigidity of the deck frame and to resist any tendency to shift or bow beneath the sliding doors. It is slightly noticeable as a small coffer from interior windows looking out underneath the deck and unseen from any other vantage point. It is desirable to consider priming and flashing or otherwise weather protecting critical areas of the girder and cross beam assembly before they are installed as access to some of these points may be difficult once the beams are inserted into the house. 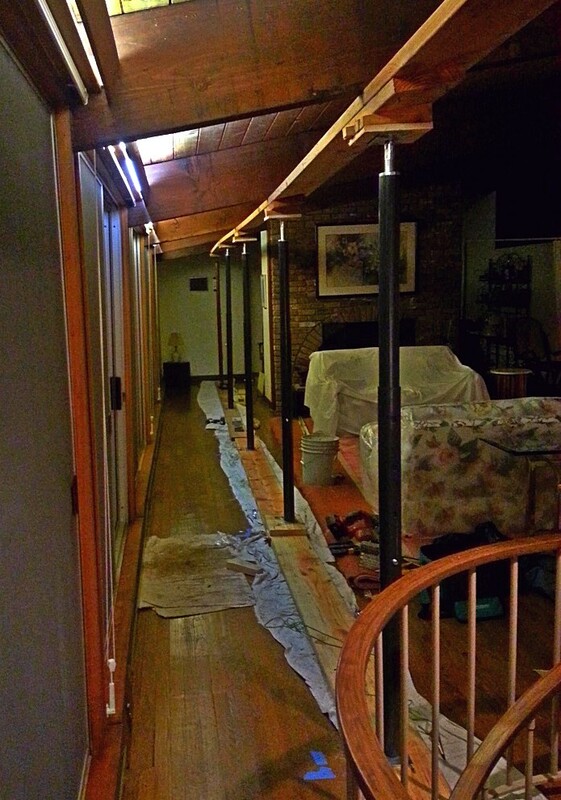 In Norwalk we used 4″x 12″ PSL (parallel stranded lumber) to replace the original girders. The posts used here are Solid ipe 4×4’s. 12″ cylindrical footings can be seen in this photo as well as custom metal connectors made by Garrison Forge. 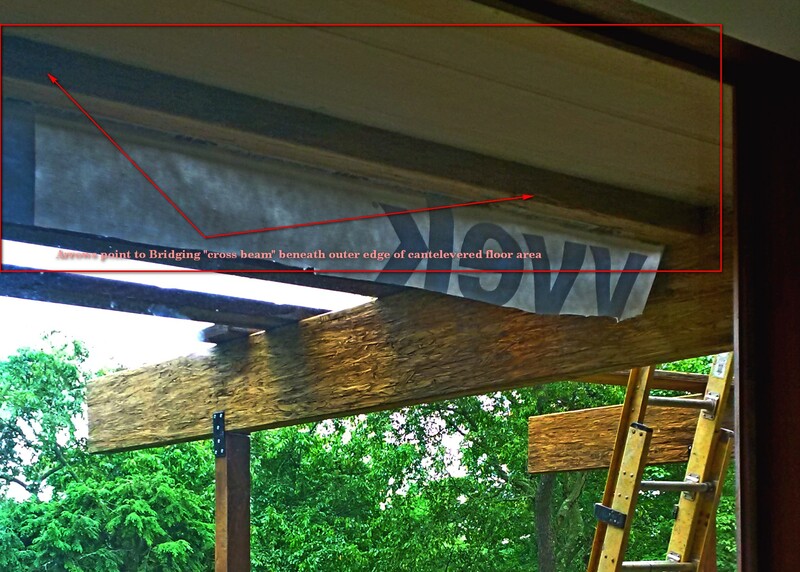 The “cross beams” or bridging mentioned in the article are behind the Tyvek housewrap in this photo. 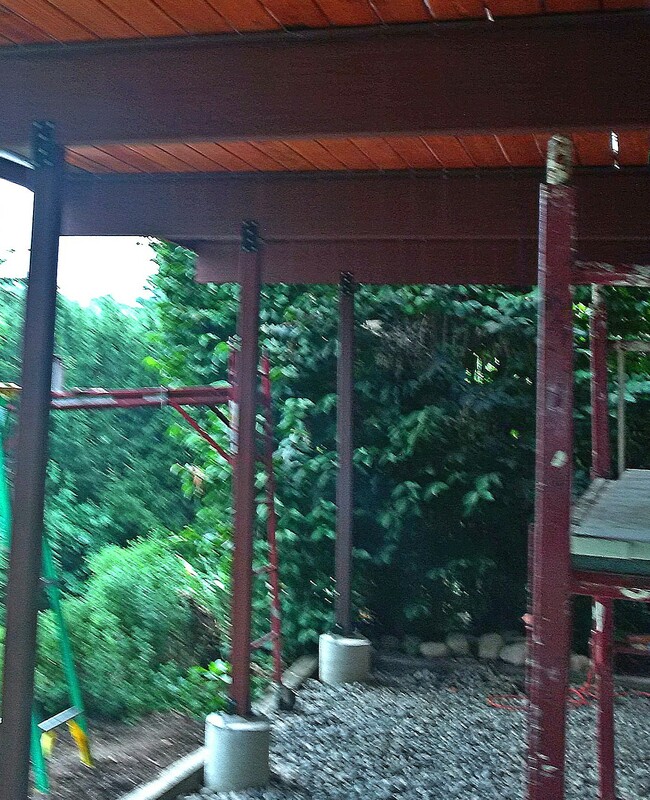 Before the flashing and decking was installed these beams were coated with a brown tinted Sherwin Williams “Adhesion Primer.” at this stage of the job the posts which support the window rafters and which lie between the sliding doors were also replaced or repaired as needed. Before the Decking was installed we carefully and thoroughly flashed the beam insertion points. The bases of the new columns were coated in flashing cement and all potential water penetration areas were flashed or treated using a combination of Grace Vycor Black Jack or other bituminous flashing cement, and metal flashing. It is easiest to complete trim work against the house before the decking is installed or to leave out 1 or two courses of the decking to allow for future treatment. At the deck line we transitioned from cedar trim material to Hardi fiber-cement based products in order to inhibit organic activity water absorption and decay. Photo shows upper level cantilever resting on newly installed girder. Bridging at edge of house is also visible in this photo. a layer of Black Jack flashing cement in which was placed on each side of the girder a typical 4″ roof eave drip edge between the drip edges a bead of Black Jack was also run. Atop the drip edge we placed a 3/8 by 2 1/4″ white oak nailing strip also set on the flat in the black jack tar. The nailing strip serves to elevate the cedar decking from the relatively wide beams and helps to prevent water pooling under the Deck boards by allowing runoff. Also the nailing strips protect the flashing on top of the girders during the installation process. Without these the metal drip edge would surely be damaged and the waterproofing disturbed during the placement of the boards. White Oak has a natural weather resistance and is a very strong material allowing its use in this thin application. 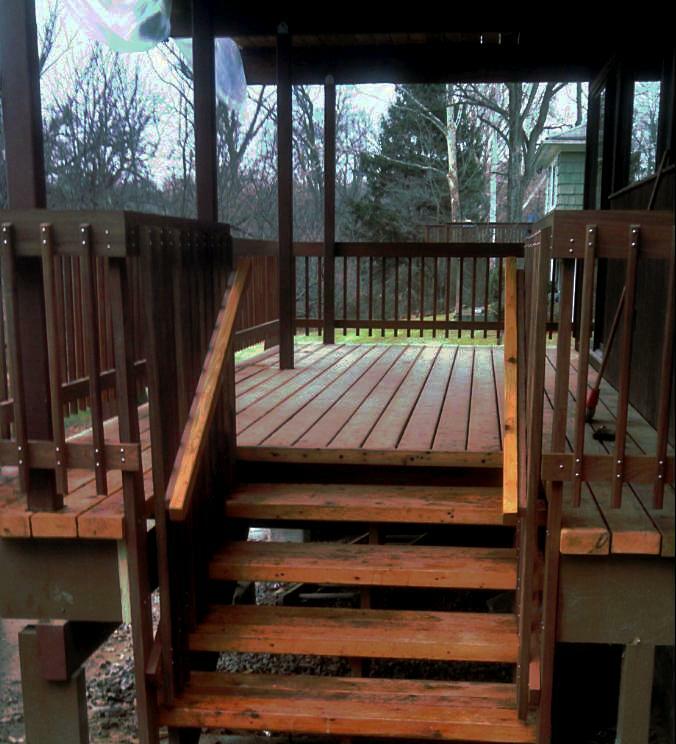 Photo shows newly installed cedar decking with flashing and nailing strip assembly. The first courses have been left off to allow detailing at the edge of the house. Unlike the original installation we will not nail the first course in to the house sill. In keeping with contemporary practice we will allow ample space for air flow between the house and the start of the decking. In this photo the metal drip edge at the top of the girders can be seen. 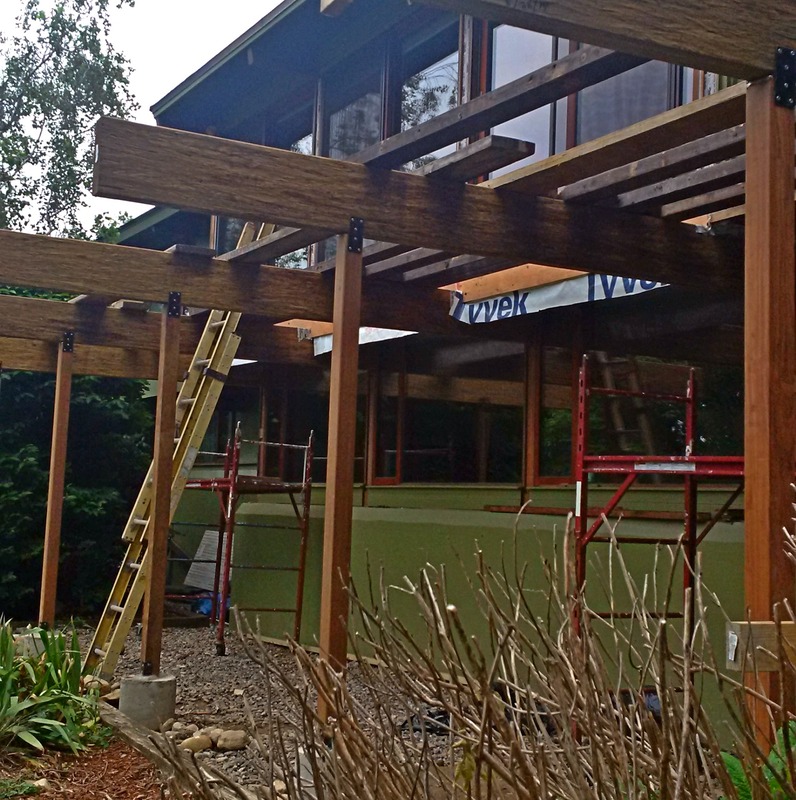 The girders have been primed two coats with a high quality adhesion primer and the posts are sealed and stained. 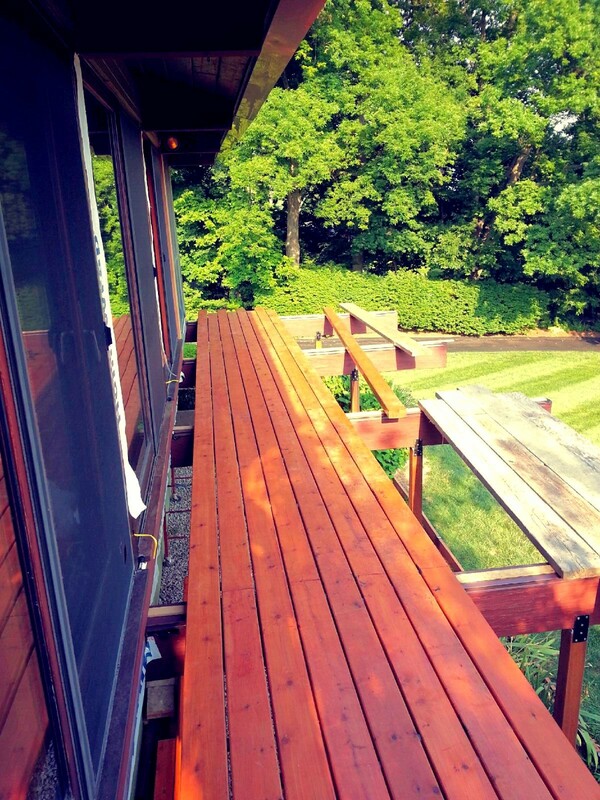 The cedar decking was finished on all sides and the ends using Duckback Superdeck. The rest of the decking is installed following the methods of the original houses. The boards are blind toe nailed through the sides down into the girders. We recommend piloting the nail holes and using a punch in order to minimize the damage of hammering to the cedar boards. We also seal the nail penetrations with an oil sealer or a little Black Jack in a caulking gun to minimize weather penetration at the nail insertion point. The boards are through nailed from the sides into each other at approximately 30″ centers with the spacers placed so that the nails penetrate the spacer and enter the adjacent board. These nails must be piloted due to their length and the importance of controlling the point of entry to the next board. Another article can discuss in greater detail the decking installation. Deck House also has materials and diagrams available to the homeowner or builder approaching this task. It should be stated that though Third Floor Corp has a productive and friendly relationship to Deck/Acorn, we do not in any way represent their company. The opinions and methodologies described in this article are solely those of the authors and editor of of the Doctor Structure Blog. The circumstances of each house is different. 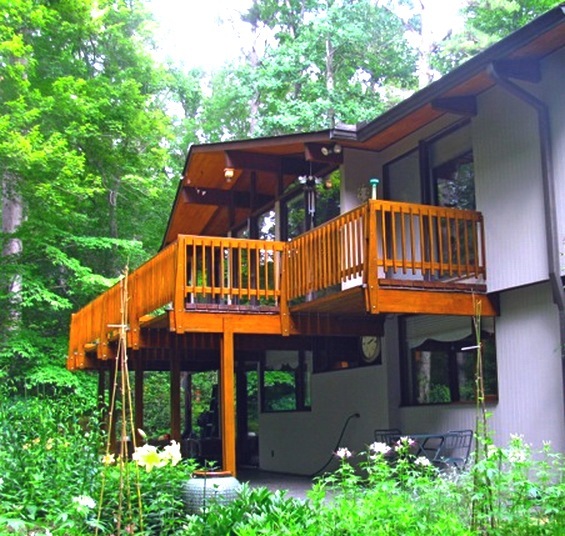 Each Deck House has its own characteristics. Structural work of the type described in this article should be attempted by experience persons or under the supervision of a master builder or professional engineer. Comments on this article, constructive criticism, questions or additional contributions are encouraged. Readers wishing to submit a word press article to this blog for publication should send a copy by email to doctorstructure@thirdfloorconstruction.com. Work at Third Floor Corporation. 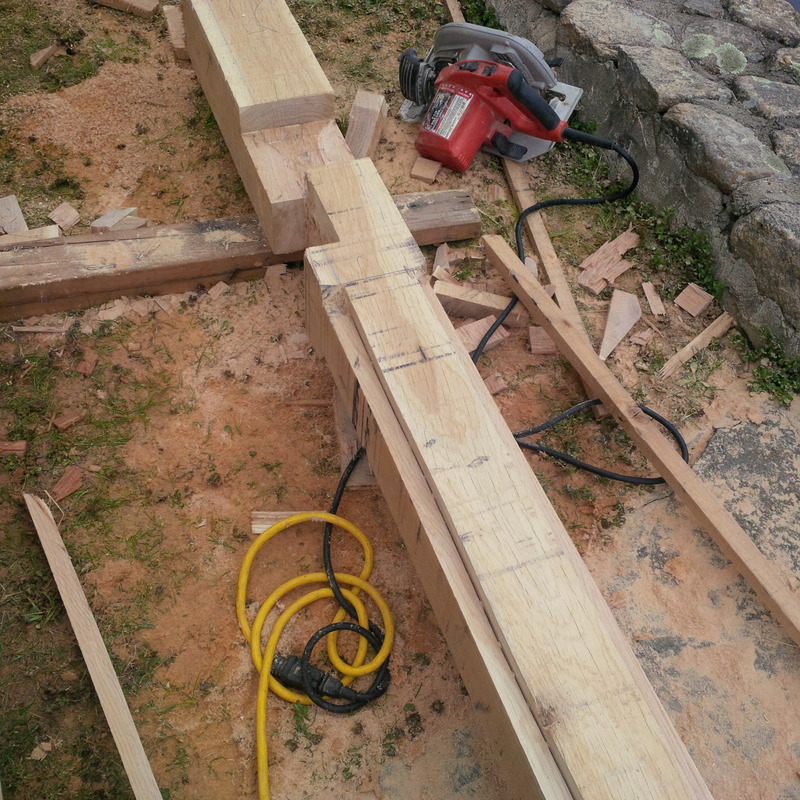 White oak post notched and mortised for exterior arbor at Garrison, NY property. Fabrication by Third Floor Corporation Apprentices. All positions are paid. We frown on the practice of “offering” unpaid “internships. ” Rather we prefer to pay and demand commitment, dedication to craft, and hard work in return. Compensation based upon experience, skill, craft development and educational level. We are always interested in the work of talented artisans, subcontractors in the mechanical trades and hard working intelligent ambitious people of any background. Please include a clear subject line in your email with these inquiries in order to evade our spam filter. Be forewarned our filter is set to weed out the vague, the indecisive, the disingenuous, catch phrases, truisms, business-school double-speak, stereotypes, bigotry, idle chatter, and, as well– of course– malicious software. Apprentice carpenter to assist lead carpenter in high end residential construction and structural repairs of antique and classic modern houses. All custom architectural work. Steady work for individuals devoted to their craft. Busy disciplined environment. Must have working cell phone, valid driver’s license and own transportation to work in Westchester, Putnam, and Fairfield Counties. Must have tools for higher paid positions. Must be in good physical condition for work in construction environment. Must be able to read construction documents. Some professional experience and education in the craft required. Strong math and technical skills a must. Paid Intern/Apprentice to master builder for custom residential construction. Excellent opportunity to learn the building trades as a direct assistant to experienced General Contractor. Must have working cell phone, valid driver’s license and own transportation to work in Rockland, Putnam, Westchester and Fairfield Counties. Must be in good physical condition for work in construction environment. Outdoors in all weather conditions. Occasional long hours. Direct participation in physically demanding construction work in a job site environment is required. High school diploma or GED required. Legal residency required. College education preferred. Strong math and technical skills a must. Detail oriented person must be willing to document site conditions and work activities. Must be able to follow very detailed and specific instructions and to communicate those instructions clearly to others. Equal opportunity. Female apprentices welcome. Principals only. Recruiters, please don’t contact this job poster. Do NOT contact us with unsolicited services or offers. Please respect our time. No telephone or text inquiries without prior written (email) contact including a letter of introduction and resume.